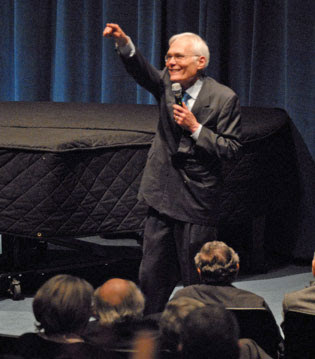 After every performance, General Director Speight Jenkins hosts a free Q&A session in the lecture hall at McCaw Hall. Listen to Tristan und Isolde’s opening night session and hear Jenkins answer anything and everything – from his thoughts on Robert Israel’s production to why he cast Annalena Persson “on the spot” when he first heard her sing. Plus, hear the audience chime in with their reactions to the cast and conductor as well as catch a few surprise drop-in visits by special guests. I SO much wanted to hear Speight's post-Premiere Q&A, but my the computer meiner Partnerin demanded that she join "Tweet" (or "Twitter") to do so, and she did not want to get on any Spam-list. So, I tried at the Landeszentralbibliothek in Schwerin (Germany), where I live aand could was told on the screen that "Probleme mit dieser Website verhindern, daß die Seite richtig ausgeführt wird." I hope I can get it when I come to Seattle in early Jan for Peter's promising "Barbiere" (if I still can't acccess the P-p Q&A over here.